Beautiful river setting on the West Fork of the Calcasieu River just minutes from Lake Charles, La. Enjoy your time here fishing, boating, kayaking or just relaxing on our Vintage houseboat docked in a canal just off the river. Launch your boat at our private boat launch, leave it tied to the houseboat and enjoy a weekend of boating and fishing! This fun decorated boat sleeps 4 with a queen size bed and ensuite in the captains quarters and a half bath in the hall area. Full size bed, a convertible sofa and 2 recliners are located in the salon area. 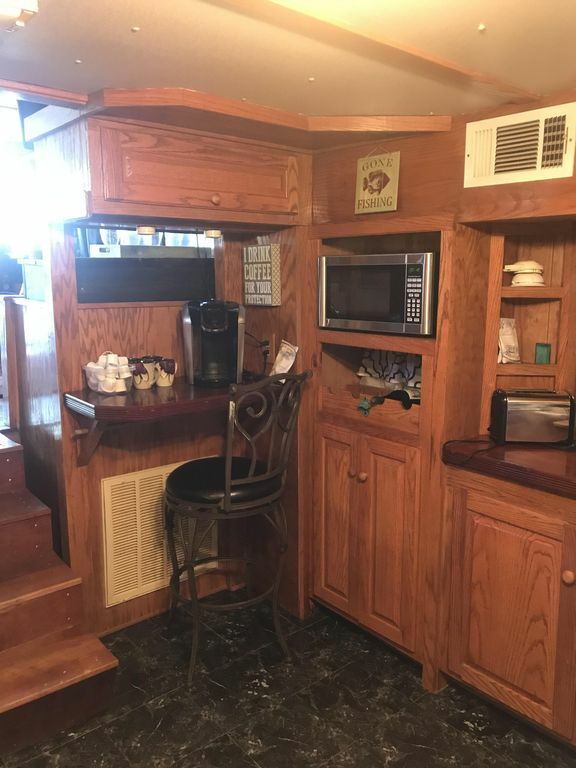 Amenities include a fully stocked kitchen with a gas stove, refrigerator, microwave, keurig coffee maker, a smart tv, blue tooth stereo, gas grill, patio furniture and outdoor heater to enjoy the gorgeous views from the top deck! This property is across the West Fork river from Sam Houston Jones State park. Come relax and enjoy your stay! Kayaks and paddle board provided. Houseboat stays permanently docked in canal during stay. Plenty of wildlife can be seen here including birds (occasionally an eagle), deer, alligators, turtles and plenty of freshwater fish. Close proximity to entertainment including The National golf course, Casinos, movies, restaurants, ball parks, shopping, etc..
Pots, pans, rice cooker etc. This beautiful private property dead ends on the Houston river and West Fork. This property is surrounded by water and beautiful wetlands. Bring you fishing poles and plenty of mosquito spray!! We enjoyed our stay very much! It was very relaxing and the owner has went beyond having anything needed to enjoy a weekend away from home stocked in This boat! If you are looking for a UNIQUE getaway that is comfortable, quiet and clean, this is perfect choice.. The waterway is secluded from the crowds, quiet and serene. If you enjoy outdoor activities, the property has a stand up paddle board, multiple kayaks and cane fishing poles for your recreational enjoyment. You are just a few hundred yards from two rivers and Sam Houston Jones State Park. (BTW, a great disc golf course at the park) If you are in the mood to gamble, there are three casinos less than 15 minutes away. Grill on the boat and have dinner on the upper deck. Enjoy a cup of coffee on the lower deck. The inside and outside areas are CLEAN, organized and stocked with all of those little things that might not have fit in a suitcase (coffee pods, saran wrap, aluminum foil, soap, etc.). If you have Pandora or Amazon music, there is a Bluetooth stereo, that is easy to pair. The interior of the boat has alot of room. The bathroom/shower area is larger than I expected. Plenty of towels! You won't be bumping into walls trying to get ready. From the first question asked before renting, to check out time, the owner of the property was quick to respond and eager to make our stay comfortable and pleasant. If your idea of the perfect getaway does NOT include paved parking lots and overcrowded beaches; if you like the idea a vacation surrounded by water... this is the perfect choice! Surprise your spouse, your family, with something different. Well maintained property with tons of amenities. Booking was easy, Kelli was very responsive and the property was very cool. The attention to detail and personal touches were great. The hospitality can’t be beat!! We will come back again. What a memorable experience! The view was the best of Cajun scenery and very worth every penny for a short stay. The stand-up paddle board was also enjoyed. Thank you to the gracious owners of the houseboat. My husband and I stayed at the boat house Memorial Day weekend and had a wonderful time. We travel a lot and we can say this was one of the best places we have vacationed at. The boat house was beautiful, clean and comfortable. Kelli and Giles were the nices people you could ever meet. They provided just about everything we needed and there was even a gas grill on the deck. We caught a lot of fish and you could even go crabbing 25 min. away. The scenery was beautiful and quiet. If you like the outdoors, this is a perfect place to go. Clean, comfortable, awesome place! Would definitely return. Had a wonderful and relaxing getaway far from the hustle and bustle of city life. The houseboat we stayed in was very comfortable and had all the amenities we needed such as a full size refrigerator, stove, microwave, eating utensils, etc. PLUS they were all CLEAN! I emphasize that because we have stayed at many home rentals where everything was dirty. The beds and linens were clean and comfortable and smelled freshly laundered. The shower and bathrooms were clean and roomy. And thank you to the owners for supplying toiletries as well as some necessities in the kitchen such as salt, oil, a keurig coffee maker that I wasn’t afraid to use because it was clean. There was even Kpods for our use. The smart tv was awesome as we got to watch our downloaded movies as well as watch some stations that came in. The owner lent us their hotspot so we were able to have connectivity. The houseboat is located on a peninsula and we were the only occupants. Yay! The fishing was great! We caught catfish and perch from the houseboat as well as from the pier at the cabin that’s in the property. The owners supply kayaks, a paddle board, as well as a pedal boat and we made use of all. The boat slept four comfortably as the living room sofa turned into a bed. The owners were very nice and accommodating. They helped us find the bait shop/gas station which was less than ten minutes away. The closest town, I think it’s called Moss Bluff is just as close. You can pick up groceries there or supplies or eat at restaurants. Lake Charles is just a very short drive away if you want to visit the casinos or eat at their restaurants. Overall, it was a wonderful trip and I give thanks to the owners for assuring we had a great time. Thank you Kelli and Giles. This beautiful private property is on a gravel road that dead ends at the Houston river and Westfork. Surounded by lots of water frontage and wetlands, that being said bring plenty of mosquito spray! !